very reliable or very flakey. Ethernet uses a building block called a PUP, which stands for PARC Universal Packet, and which is nothing more than a type of datagram. Dave is a very strong supporter of the datagram approach (almost a missionary) and encouraged me to study his paper describing the PUP (see the April 1980 issue of IEEE Transactions on Communications). 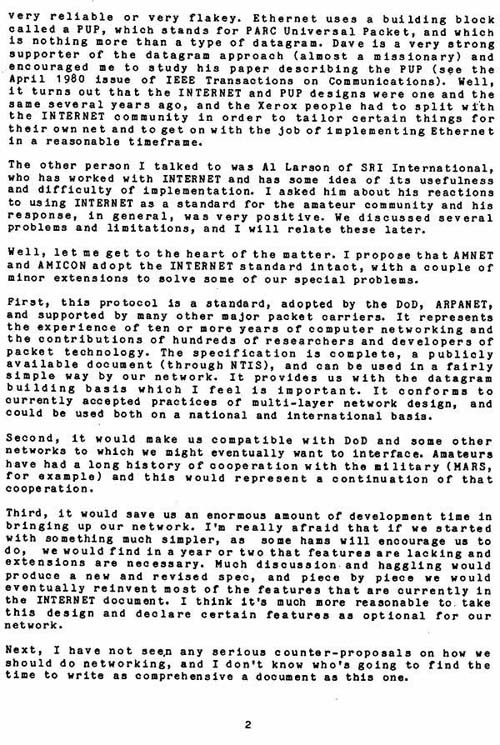 Well, it turns out that the INTERNET and PUP designs were one and the same several years ago, and the Xerox people had to split with the INTERNET community in order to tailor certain things for their own net and to get on with the job of implementing Ethernet in a reasonable timeframe. The other person I talked to was Al Larson of SRI International, who has worked with INTERNET and has some idea of its usefulness and difficulty of implementation. I asked him about his reactions to using INTERNET as a standard for the amateur community and his response, in general, was very positive. We discussed several problems and limitations, and I will relate these later. Well, let me get to the heart of the matter. I propose that AMNET and AMICON adopt the INTERNET standard intact, with a couple of minor extensions to solve some of our special' problems. First, this protocol is a standard, adopted by the DoD, ARPANET, and supported by many other major packet carriers. It represents the experience of ten or more years of computer networking and the contributions of hundreds of researchers and developers of packet technology. The specification is complete, a publicly available document (through NTIS), and can be used in a fairly simple way by our network. It provides us with the datagram building basis which I feel is important. It conforms to currently accepted practices of multi-layer network design, and could be used both on a national and international basis. Second, it would make us compatible with DoD and some other networks to which we might eventually want to interface. Amateurs have had a long history of cooperation with the military (MARS, for example) and this would represent a continuation of that cooperation. Third, it would save us an enormous amount of development time in bringing up our network. I'm really afraid that if we started with something much simpler, as some hams will encourage us to do, we would find in a year or two that features are lacking and extensions are necessary. Much discussion and haggling would produce a new and revised spec, and piece by piece we would eventually reinvent most of the features that are currently in the INTERNET document. I think it's much more reasonable to take this design and declare certain features as optional for our network. Next, I have not seen any serious counter-proposals on how we should do networking, and I don't know who's going to find the time to write as comprehensive a document as this one.